Donald Cerrone has a everlasting flame burning a hole in his pocket. Donald ‘Cowboy’ Cerrone was a happy man after landing a head kick knockout to finish off Adriano Martins on Saturday, and he’ll be even happier after he cashes his 13th UFC bonus check on Monday. Cerrone was given a $50,000 bonus for ‘Knockout of the Night’ in addition to his regular purse and win bonus for the victory. Just recently, Cerrone had commented about his financial state where he tends to spend the money he makes as quickly as he gets it. There’s just something about having money in his pocket that Cerrone can’t help himself but to spend it. As a known outdoor enthusiast, Cerrone has bought boats, guns, wake boards and any other kind of ‘toy’ you can think of just after winning a fight. Following his latest win, it sounds like he’s already found a way to spend the $50,000 he’s receiving as a bonus. I want to set a record for the most fights in a year. So, if I can get six this year that would be f—king great. 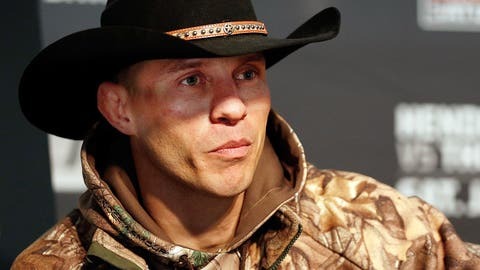 "Like a fart in the wind it’s gone," Cerrone said while knocking back two cans of Budweiser at the post fight press conference. "I’m sure Cabela’s will get a big chunk of it." The outdoor superstore will probably want to call their Albuquerque, New Mexico location to tell their salespeople to be on the lookout for Cerrone – he’s 6’0" tall and chances are he’ll be wearing camouflage and a cowboy hat. Following his latest spending spree, Cerrone will then try to get a fight again as quickly as possible. Winning one bonus isn’t enough – Cerrone would like to add another milestone to his resume by the end of the year. "I want to set a record for the most fights in a year," Cerrone said. "So if I can get six this year that would be f—king great."